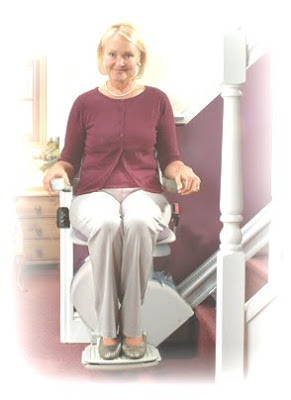 Stairlifts: Stairlifts in Staffordshire - or Aeroplanes in Spain. Which take longest to fix? Stairlifts in Staffordshire - or Aeroplanes in Spain. Which take longest to fix? Many modern gadgets have lights on them to warn you something is wrong - or about to go wrong. Usually such a diagnostic display, as it is known, will tell you exactly what there is to sort out. We have gone a long way since a dock leaf from the side of the road was employed to wipe the oil dipstick. That metal stick, then told us, or told our parents/grandparents - that there was no oil in the car! Maybe that is why it broke down. So then the oil light evolved. Then, with a few inventions in between - came the modern DC (battery operated) STAIRLIFT - and what a delight for companies like us when someone calls us to say the lift has packed up. A number between 1 -12 is flashing, or maybe a certain letter. We know from this, if it has been accidentally switched off - or the batteries have flagged (unusual, but now and again it happens) or various other things usually connected with the circuit board. This magical circuit board is the brains of the chairlift. If it has caused a problem then the remedy is simple - a new circuit board. If a call out is necessary - we are all ready for it - quick, simple and soon the lift is back in action. Monarch Airlines flight ZB 626 Manchester – Lanzarote - 2/02/2010. On board - 5 stewardesses, 2 pilots, approx. 188 holidaymakers and a working (more or less) stairlifts company proprietor from Newcastle under Lyme. Half an hour from arrival I wondered why I had for years preferred routes via Madrid to visit our offices in the Canaries. After all, the trip was taking under four hours, I had an extra legroom seat, a meal that was OK and I was looked after by professional staff – then, sadly... it was problem time. No, the wine hadn't run out. The pilot calmly announced that poor visibility would mean a trip around the island, getting us there 15 minutes late at 12.15 pm. No big deal, but I noticed sometime after a quarter past twelve that we had swerved away and heading for the adjoining island of Fuertaventura. A still calm voice from the cabin was heard again but with slightly more disturbing facts. The flaps had failed to open meaning, whilst the aircraft was ‘capable of landing without them - we needed a longer runway’ and that was to be found on the neighbouring island 15 minutes away. Then there was a ‘But.’ And the blood pressure went up. We were going to have a landing ‘faster than normal' and added that 'the fire engines would be there as a precaution.’ When he announced that we were to pay attention to instructions from the crew - it rang to me of something different, not experienced in 40 years of regular flying – an emergency landing. The cabin staff girls put on smiles a little exaggerated – I suspect that is practised in their training. The one who joined me in her jump seat in the emergency exit couldn’t smile for long. An eerie silence throughout the plane contrasted a previous holiday type buzz. Eyes were closed everywhere and couples squeezed each other's hands - even those who hadn't done so for years. We hit the tarmac fast. How fast, I did not realise until later. Brakes screamed and the aircraft went, at speed, what seemed an awful long way on the ground – overstepping onto what was clearly not normally used tarmac - therefore a section littered with debris. Debris which may have included dust, small pebbles or building blocks, I don’t know – but the noise was frightening – with the sound maybe like that of a machine gun attacking the underside of the plane. I kept looking at the adjoining emergency exit door. For the first time in my life I read its opening instructions. Is there a turbo stairlift the other side to make a descent? If not, there’s no time to do a quote. Brakes were rammed on and golly they were loud – and everyone wished and hoped they were good ones. We eventually stopped with fire engines on both sides chasing us. Thankfully, they didn’t need their foam or water. Any stairlift in situ the other side of my exit door would have remained idle. An apology came from the pilot amongst a ripple of applause from all, and he told us we had landed 'at 170 knots' – but the inconvenience suffered was better that ending up, he said casually ‘in the sea at Lanzarote.’ He then – or it may have been his co-pilot, told me at the departure steps whilst he proudly saw us off – that 170 knots meant we had landed at 200 mph! – against what would normally have been 40 - 50 mph. We all waited for some three hours in the transit terminal without news, and then suddenly the departure of our aircraft to Lanzarote was announced. I happened to know by talking Spanish to various airport staff earlier that a local engineer had checked the aircraft flaps within 20 minutes of us arriving, and all appeared OK – a fact that supports what I think to be the next and most startling part of my tale. We boarded and took off again – scheduled to arrive at Lanzarote within 15 minutes at about, I think, 5.30pm. Then the impossible happened. Virtually over our intended destination island, the now almost standardised tone of apology came back over the loudspeaker.... and guess what? Those flaps yet again, would not open – so 'we were going back to Fuertaventura.' The pilot said he had done his best but apparently the fault could not be simulated on the tarmac after the first emergency landing, so the reason for the problem was not clear. He surmised that it might have been that the flaps worked on the ground but not with the full weight of people on board. So what had been a novelty of a first time bullet-style landing was to be repeated. All heads shook in disbelief. Only sober and mature Brits could absorb such drama without audible passion. Once again, the debris, the fire engines, closed eyes etc – but this time it was made worse by the incredible repetition of what should have been a once (or never) in a lifetime experience. So it was buses again to the terminal – and an indefinite wait for more instructions. The uniformed Monarch official again saw us off the plane – but this time with a glaze this time of embarrassment rather than pride. Now, it’s question time – and I have emailed the MD of Monarch, Mr Tim Jeans, as I’d be grateful of a response by someone in authority at the Airline. The answer if I get one, may deter me from doing what some contacts of mine who work in the aviation industry want me to do here in Spain – and that is file an official complaint to the Guardia Civil, who will alongside other authorities investigate possible negligence, unnecessary risks to passengers in an aircraft by possible irresponsible flying practices - or inept technical services on the ground. Someone gave authority for that aircraft to take off again – only to suffer a second emergency landing the same afternoon. So, to sum up, an aircraft is diverted and grounded due to an essential item mal-functioning. Then the reason for flap failure is unknown and not discovered. A fact later admitted by the pilot to passengers. In non-airline speak - ‘an intermittent fault’. The same aircraft takes off – the same happens and a further emergency landed is deployed – putting some 200 passengers again, in my opinion, at risk. WHY SHOULD THIS BE ALLOWED? If a faulty aircraft does not have its fault diagnosed and remedied, should it not be immediately grounded? It’s OK using an old STAIRLIFT if it keeps packing up and a retired and out of touch engineer can’t find the fault – but surely not a passenger airline!! On a lesser note, yet still an important issue; can Monarch please explain why the passengers on this scheduled flight, not charter, who suffered a delay of his magnitude (original arrival time 12pm) were not offered free refreshments? When I left this fracas at 6pm and continued my journey to Lanzarote by taxi and boat, no one, not even children had been offered as much as a glass of water. What happened after 6 pm I have no idea – maybe the nightmare continued until the following day. It would be interesting to know if this aircraft – an Airbus 321 (registration G-OZBN) built in 1999, and flying, according to the Spanish press, since 17th December of that year, has had previous similar problems. Over to you Mr Jeans. Update - 2 weeks on, no reply to the email, so a recorded letter- (snail-mail style) has gone off to Monarch. Perhaps Mr Jeans is on leave in the Canaries. Watch this space.Update - 2 months on, no reply from anyone at perhaps they are all too busy fixing flaps. We asure Mr Jeans and his executive colleauges - that a certain stairlifts company fom Staffordshire doesn't hold grudges. If if anyone of them have a chair lift from us, whether they live in Stafordshire, Cheshire, Manchester or anywhere in England - and it breaks down - we'll offer them our usual prompt service! Amazing how the owner of an airline after several months of this blog being on page on of Google cannot be bothered to reply. They have lost no end of customers after a story like this goes public. The owner of the firm who wrote this did this in a light hearted way but clearly has a lot more business sense about him than just stairlifts. Great write up. Myself and family were on this flight, we're trying for compensation now but Monarch are making it VERY difficult. TERRIBLE COMPANY.